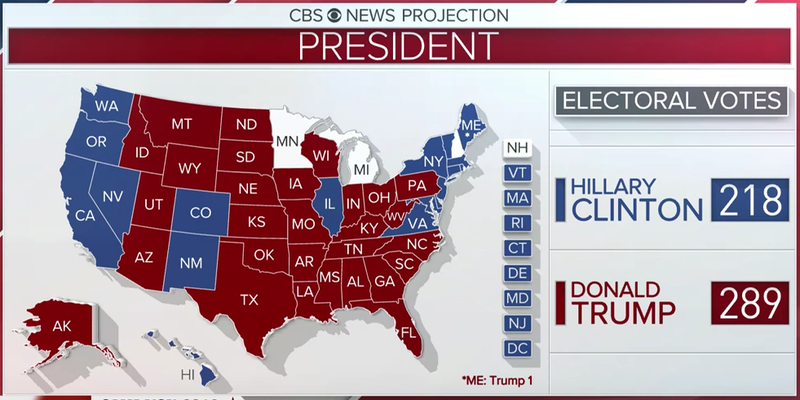 The image above was shown on CBS News the morning after November 8th. I know of no other map in recent American political history that shows Minnesota still out, still waiting to be called, the morning after a presidential election. It doesn't get any more emphatic than this but to follow Minnesota republican politics after the consequential election of Donald Trump as our 45th president, you wouldn't know it. I've thought for a long time, as anyone who's read me knows, that Minnesota republicans are timid, shy, unsure of what they stand for and are afraid of a mediocre, particularly liberal & tedious, media in a third tier market. Additionally, too many of those who direct elected republicans have succumbed to the Stockholm Syndrome of their donors. What they want, they get. Sound familiar? Trump understood first and foremost that the Republican Party had failed its so-called constituents. He then coupled his message with, and directed it toward, those democrats who felt the same way about the Democratic Party. There is simply no other way of explaining why he won 78 out of 87 counties in Minnesota and came very close to carrying the state outright. Of course, had our schlerotic party aparat gotten behind him, he might very well have. Ticket splitting is what passed for sophisticated political analysis in the media here after the election in explaining Trump's Minnesota results. Only regulars on "Almanac" or "At Issue" would think that either insightful or persuasive. Now, though, in the cold March light of mixed weather, we can assess what republicans in Minnesota have done, not quite two months into a transformative Trump administration. The answer is not much. I understand that the House republicans have an agreement with the Senate republicans not to pass anything that can't be approved by the latter body. Advantage: the Chamber. But as for anything else, well, good luck to you school choice. Sunday liquor sales passed into law. Please clap. I was for it but thought it a distraction from the obvious task of republicans taking advantage of Trump's strong showing here. The reality is that most of the MNGOPe were strongly against Trump. In the face of his transformative win, the best they can come up with is to ignore it. The DFL doesn't, however. Far more alert to realpolitik, and keen to win back those DFL voters who had previously voted Obama but this cycle voted Trump, they seek to repair and rebuild those political relations that can keep them winning statewide elections, now a decade old. That's right: it bears repeating that Minnesota republicans have not won a statewide race in a decade. The focus now, of course, is on winning the governorship. I want a republican to win that office. The question everyone puts to me, which I tire of and turn back upon themselves is: do we have a republican contender who can do that? Accidental Speaker Kurt Daudt doesn't really think he's qualified to be governor, it's just the next step he's been told to take. There is no substantive case to be made for Daudt, on his own, to become governor. Rich Stanek needed to stop reading his press clippings a long time ago. He's fine, not great. There are no indications that Stanek will realize his ego gets in the way of his goal. There you have it, the top two contenders for the republican nomination for governor in 2018. I've heard all the other names. So have you. They don't matter.